The Ramadhan season is here, in which our Muslim friends fast during daylight hours. Therefore, breaking a fast has never been more unique. Quite recently I had the opportunity to “buka puasa” at the Saujana Hotel with a few friends of mine. 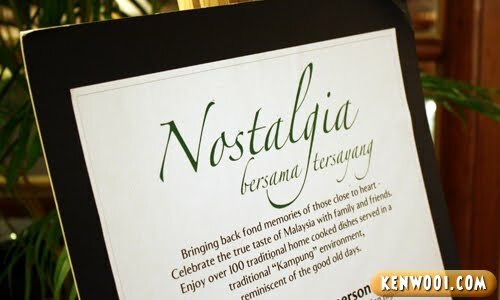 Combining a few in-house eateries together, Saujana Hotel presents their “Nostalgia Bersama Tersayang” Buffet at a large scale. 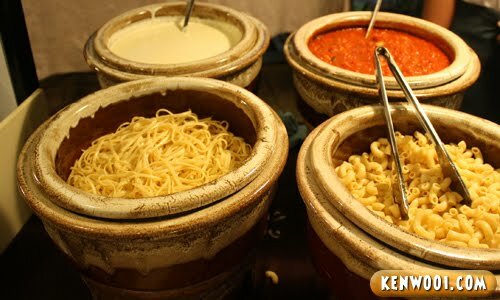 Located nearby the swimming pool, the buffet offer over 100 traditional home cooked dishes served in a traditional “village” environment, to reminisce the good old days. An interesting feature to look after right? Anyway, let’s move on to some of the food shall we? One of the main favourites is none other that the satay. The satay meat is prepared to perfection. When dipped into the satay sauce, the combination tastes really good. The edges of the satay have a little crisp while the meat is tender and juicy. Another view of the freshly prepared satay. Every time we head for another round, we’ll definitely grab a few sticks onto the plate! Just can’t resist the delicious temptation! Other than that, they have various local and international food too. 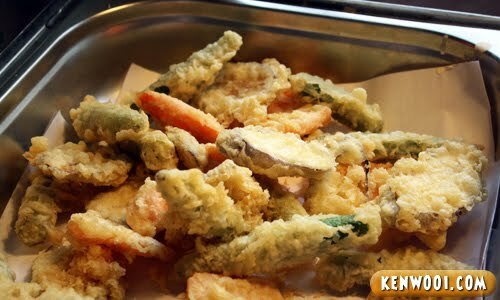 A good international example would be the vegetable tempura, obviously a Japanese meal. 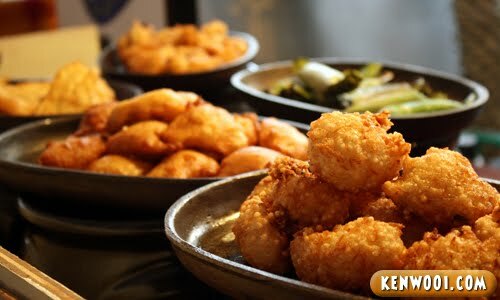 The texture of the tempura batter is crunchy, and complements well with the softer vegetable. 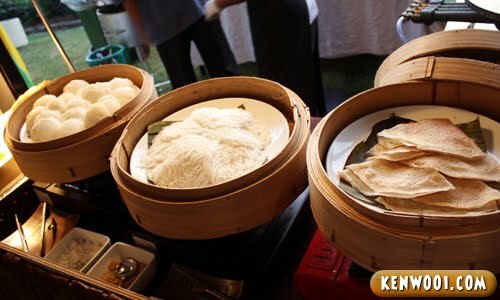 They also have a particular stall which features buns, putu mayam and some crispy-looking crepes. 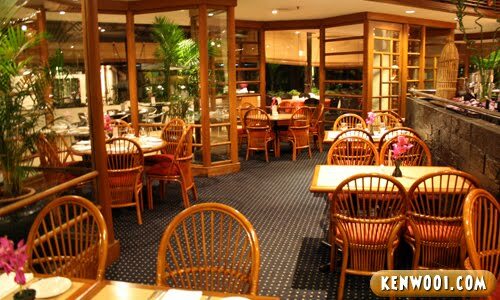 Besides that, there are various Malay pastries – all freshly prepared by the chefs. Therefore, it’s still warm and tasty. 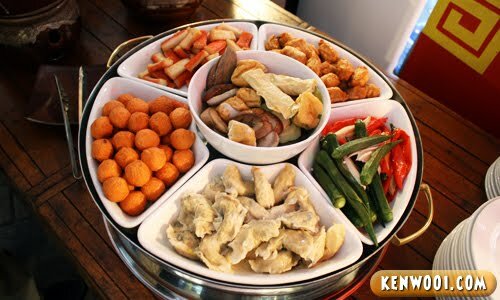 Here’s a huge platter featuring common yong tau fu ingredients such as crab meat, prawn balls and fish meat in chillies. 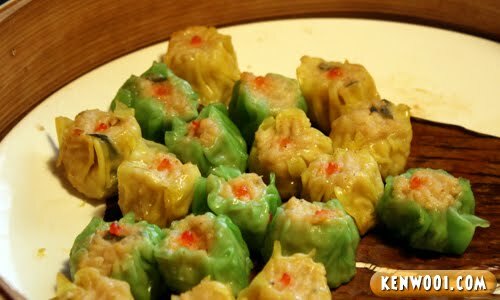 More local Chinese cuisines such as fried kueh kak and noodles. 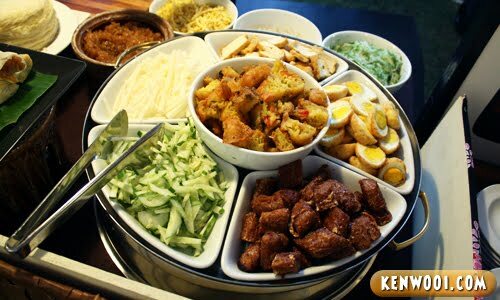 Next up, another big platter with ingredients for Nyonya Baba food. You can have them individually, or if you like – the cooks can instantly prepare a simple dish for you with the ingredients. 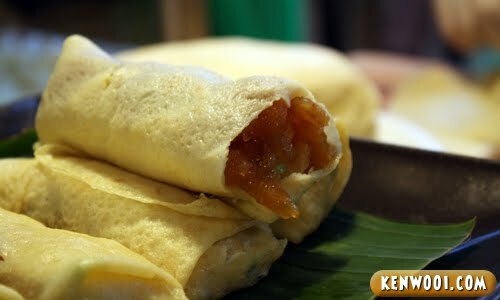 Soft popiah are also available. With the guests frequently taking it, I noticed the cook kept making fresh new ones none-stop. 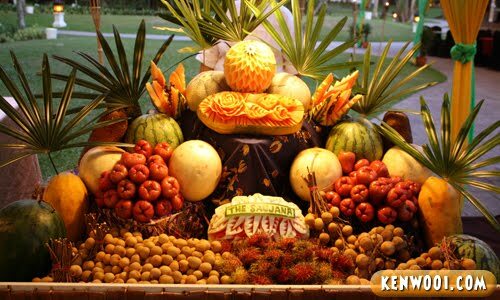 Besides that, tropical fruits well-decorated for our viewing pleasure. But you can actually take some of the fruits there. For desserts, there are quite a few selections – but I’ll highlight the ais kacang stall. 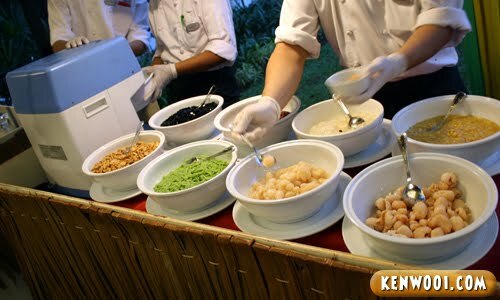 Getting to choose your own topping is fun, my favourite would be the chendol! Other than that, you get the usual kuih-muih and cakes. Alright, for RM94++ per person, the promotion is currently ongoing and will end on the 26th August. 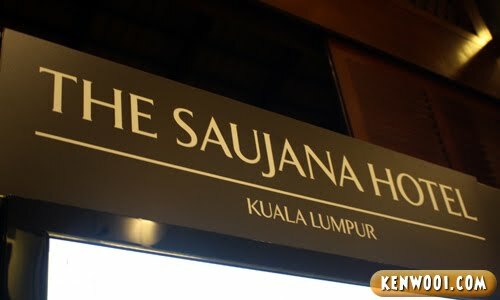 What I love about the buffet spread here at Saujana Hotel is that the food are prepared on the spot by cooks, therefore they are still fresh – unlike certain places where they prepare in bulk and leave them to cold off. ahhh,this is refreshing.. ^_^.v.. Hahaha.. why did I don’t have the chance to eat there.. ^_^.v.. 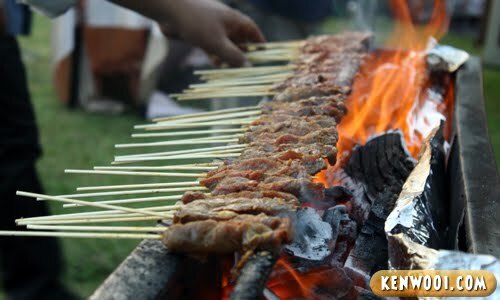 I saw most satay in Ramadan buffet spread.. look Tempting..
Ken, I really hate you when you update your food post in the middle of night. Now I have to go and find foods because my stomach keep on growling by looking at your pic. 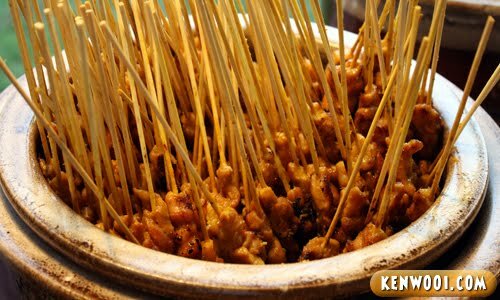 Ooooooooooooooooooo.. the satay looks good!!! Got tapau some for me or not?!! Expensive. No senior citizen discount? No teeth, cannot eat much…pay 25% enough lor… LOL!!! Nice photos, Ken. Love the one with the satay on the grill. wah you also another lucky one get invited for ramadhan buffet. the satay looks tempting!! Drooling… look at the food! dim sum above looks interesting :) compare with what I have before lol . 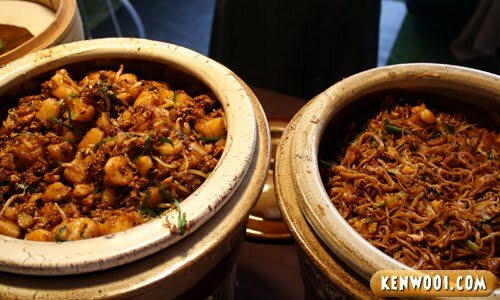 . .
nasib baik tengok waktu malam..kalau tak batal puasa..untungla makan sedap2..
Wow! Looks delicious! But no buffet for me. Can’t take it! Too many calories to get rid of later! Haha!! Everything is so yummy but being such a small eater, its a big waste for me and buffet. Most I can go is probably 1 plate. I was there! I miss the satay and mutton… yum!